Cardigan and Sweater knitted in Merino Blend 4 Ply. Suitable for the whole family. 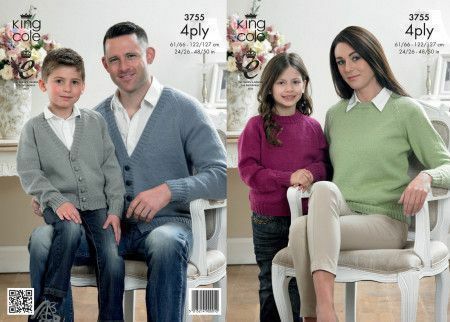 Boy's Cardigan shown in Shade Silver (036). A 2.75mm (UK12) 80cm Circular Needle is also required. Girl's Sweater shown in Shade Mauve (898). A 2.75mm (UK12) 80cm Circular Needle is also required. To Fit Chest 24/26 - 48/50"